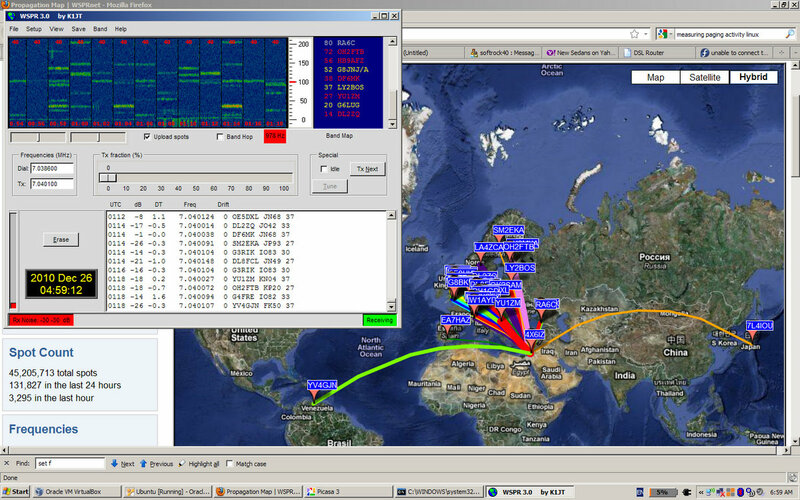 Frequency hopping is a good way to increase the number of WSPR spots, especially on bands that appear to be closed. 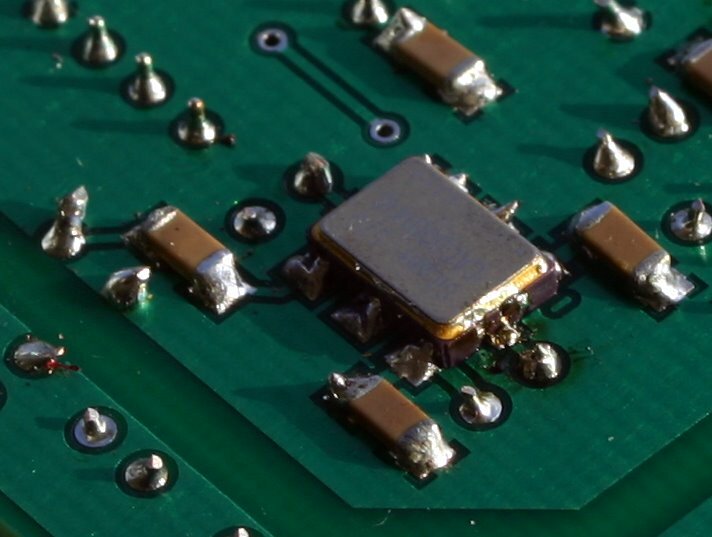 Another way to increase the number of spots is to deploy low-cost crystal-controlled receivers and transceivers. I have a couple of crystal-controlled Softrock receivers, one for 7MHz and the other for 14MHz. The 14MHz one does not cover the WSPR band, but the 7MHz one does. I decided to give it a try. 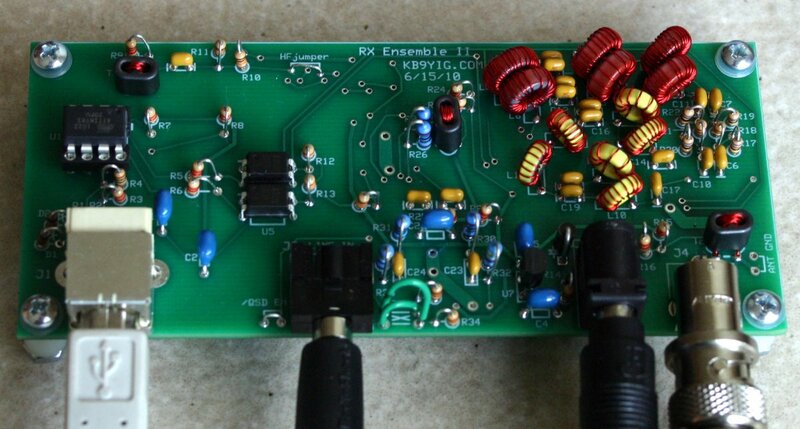 One approach is to use PowerSDR or SDR-Radio to do IQ SSB demodulation, output the demodulated audio to a virtual audio cable (VAC), and feed the VAC audio to WSPR. But since WSPR can now do IQ demodulation itself, I thought I should be able to do it without a separate program to demodulate the audio and without VAC. From my experiments with the Si570 Softrocks, I knew that the trick would be to set the frequency-offset parameter in WSPR (this parameter is called Fiq in the GUI). There was already some discussion of how to set it on the Softrock users’ group, but as far as I could tell nobody reported success. One evening of experimentation resulted in a failure. One difficulty is that with WSPR you only see a 200Hz portion of the spectrum, so if you are off the mark for some reason, you simply don’t see any WSPR signals (or no signals at all). The next evening I decided to examine the sources. From the sources I discovered a formula for setting Fiq, based on the center frequency of the receiver. I gave it a try but didn’t see any signals. I did not measure the center frequency very accurately, so I knew I could be off. I moved Fiq by 100Hz and tried again. Success! I could see signals. But from comparing my reported frequencies to other reports on WSPRnet, I realized I was still around 15Hz off. I reduced Fiq by 15Hz and my reports matched those on the web site. Joe Taylor will include the formula in the manual of the upcoming WSPR 3.0. Another issue that you need to work out is whether your IQ signal needs to be reversed. On the current beta version of WSPR, if you use the “Left/Right=Q/I” in Rocky then you don’t need to check “Reverse I/Q” in WSPR. I left the receiver on for 5 hours (more precisely, until my laptop’s battery ran out) and spotted a large number of stations (343 spots, ranging from Japan to Venezuela). If I can find an antenna, sound card, and computer for this receiver, I can keep it on all the time. I’ll see if I can do it with a low-power computer; I prefer not to waste hundreds of watts on this. I think that crystal control can also be used on 10MHz Softrock receivers and on 7MHz and 10MHz crystal controlled transceivers from both the Softrock line (like the 6.2 RXTX) and the GenesisRadio line. I believe that the center frequencies of the 14MHz and 3.5MHz crystal-controlled radios from these lines are too far from the WSPR frequencies to work; I didn’t check the 1.8MHz frequencies. 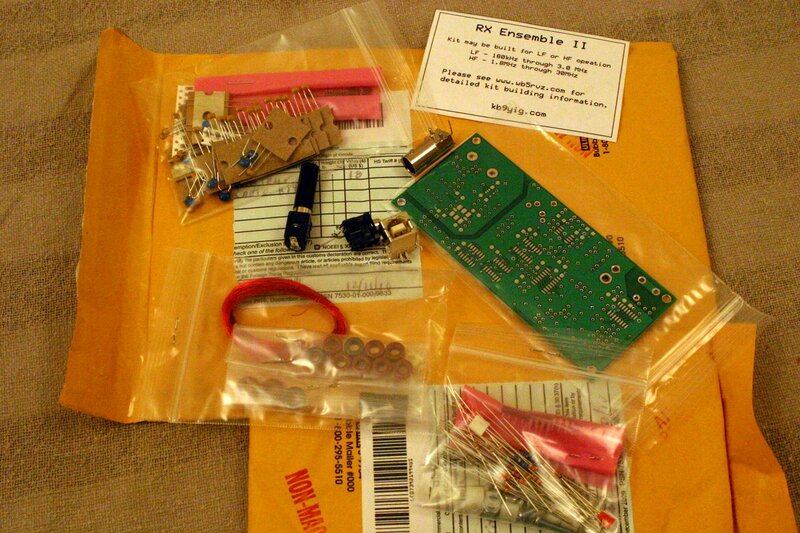 I was eager to try out WSPR hopping on all bands, not only the 7, 10, and 14MHz bands that my Softrock Ensemble RXTX covers, so I ordered a Ensemble II RX kit from Tony Parks. The kit arrived a couple of days later in two envelopes. Building the kit took a few hours. I didn’t count, but it was probably 8 or 10. The build went relatively smoothly. I used Robby’s fantastic instructions to sequence the build and to help in identifying parts. The main snag during the build was that the Si570 synthesizer did not produce the frequencies that it was told to produce. (I discovered this with an oscilloscope, which is really useful for this kind of debugging.) The USB connection worked fine, so the microcontroller received the tuning commands from the laptop, but for some reason the Si570 did not actually tune. A visual inspection of the soldering suggested that pad 7 (SDA), the one on the right in the picture, is not soldered properly. Pads 7 and 8 are really tiny and are difficult to solder; the other 6 are larger so they are relatively easy to solder. I did my best to fix the soldering and the synthesizer started working. Since the soldering problem was at the one of the I2C pins of the synthesizer, I assume that the microcontroller was not able to communicate with it at all. Unfortunately, it appears that the microcontroller does not inform the USB host that communication with the synthesizer fails, so on the PC side you think that everything is fine. Other than this I didn’t have any particular problems. A couple of solder bridges on the SOIC and SOT-23 packages, but they were all easy to spot and easy to remove with a solder wick. That was about it. I connected the receiver to an antenna and started using it. I need to put it in a box, but it’s already usable. I left the receiver connected to the wideband active loop and to a laptop running a beta version of WSPR 3.0 for 24 hours, and hopping on all the 10 amateur HF bands. I received distant stations on 3.5, 7, 10, 14, 18, 21, and 28MHz. On 5 and 24MHz there were very few transmitting stations and I didn’t spot any of them. On 1.8MHz there were quite a few transmitters, but either propagation was not good enough for me to receive them or the noise level was too high. But the range of frequencies that I did receive indicates that both the receiver and the antenna work reasonably well over all the HF bands. To feed the active antennas, you need bias tees, which feed DC to the coax near the receiver and extract it at the antenna amplifier. 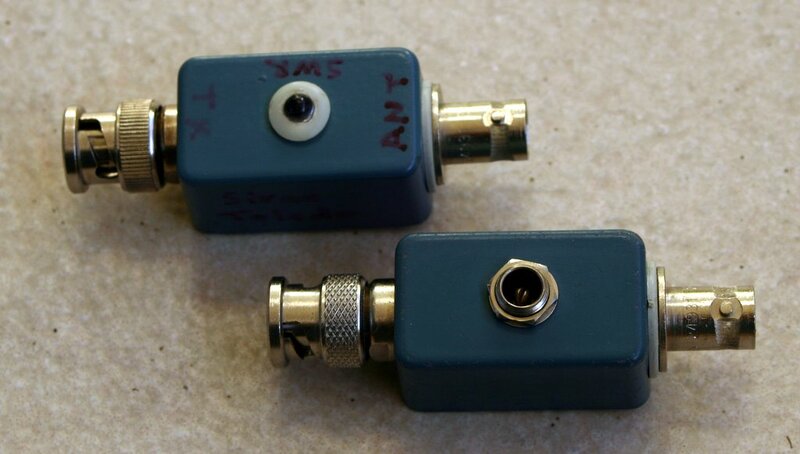 I normally build the amplifier-side bias tee into the amplifier, but on the receiver side I use a small box with two BNC connectors and a DC connector, the bottom one on the picture on the right. The gadget on the top is a resistive SWR bridge with an LED indicator. 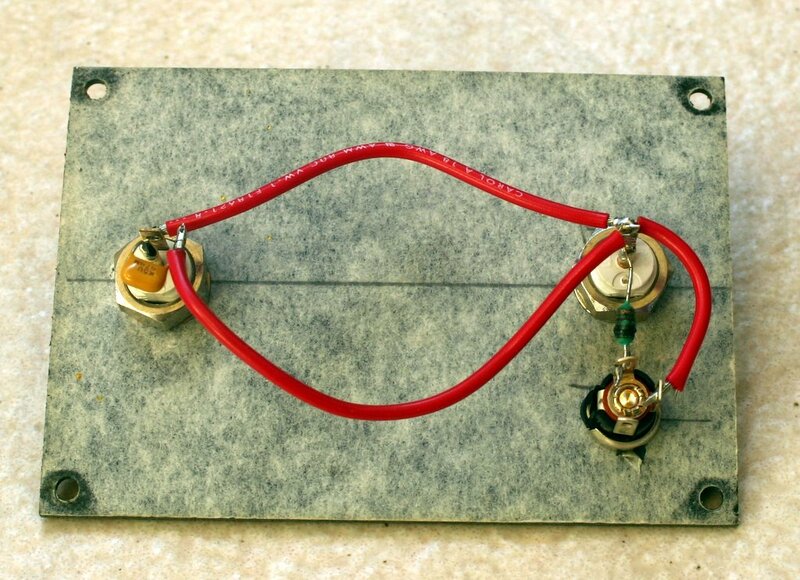 The design of the bridge is from Steve Weber’s low-power L tuner; it works very well. Both are built into boxes that used to house Tektronix test-equipment inline gadgets called input RC normalizers, which consist of a resistor, a capacitor, and a trimmer capacitor. The box has a little hole with a plastic cover to let the user adjust the trimmer. To use the box as an enclosure for something else, you remove of course the original contents. In the bias tee I enlarged the hole a bit and used it for a panel DC socket. In the SWR bridge I drilled the plastic cover to make room for the LED. A third normalizer became a 50Ω terminator. I have a few more of these boxes that I bought at a swapfest, along with two slightly different ones (a slightly bigger inline Pomona box, and one with 3 BNCs). Very handy for building little inline or 3-port devices. Bias tees are very simple devices, consisting of just an inductor and a capacitor. 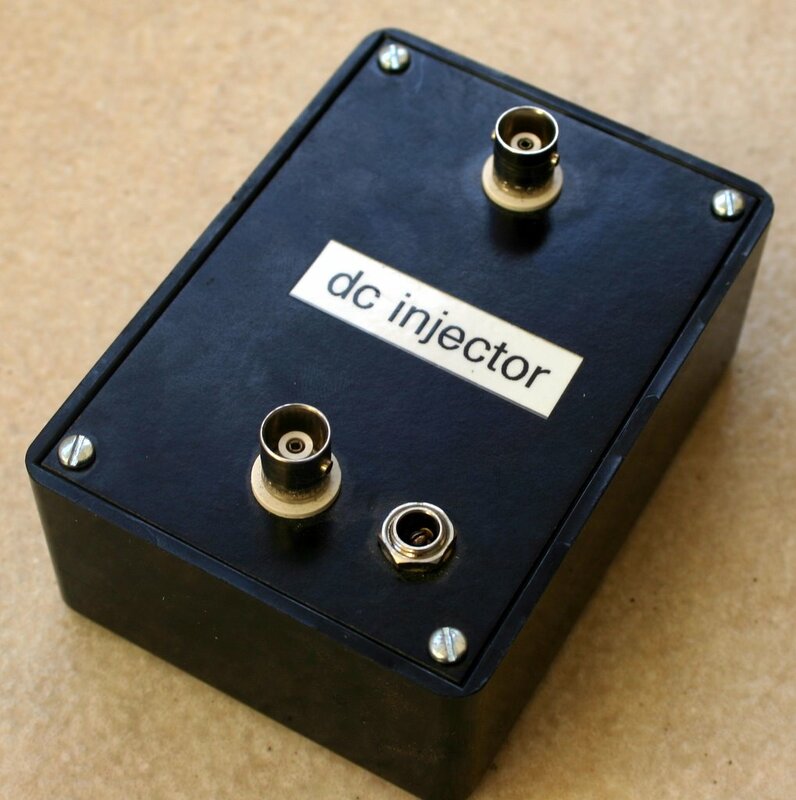 The inductor lets DC pass to the antenna but prevents RF from going into the DC power supply; the capacitor prevents DC from going into the receiver but allows RF to pass. In spite of the simplicity, it is possible to build them incorrectly. The mistake I made with the first bias tee I built for active antennas was to use an inductor with too much resistance. The series resistance caused it to heat up and burn (I think it happened when I used it to feed the active whip). In the pictures below you can see on the left the packaged bias tee (it’s huge for no good reason); on the right you can see the inside, with the burned inductor, which is now just an open circuit. 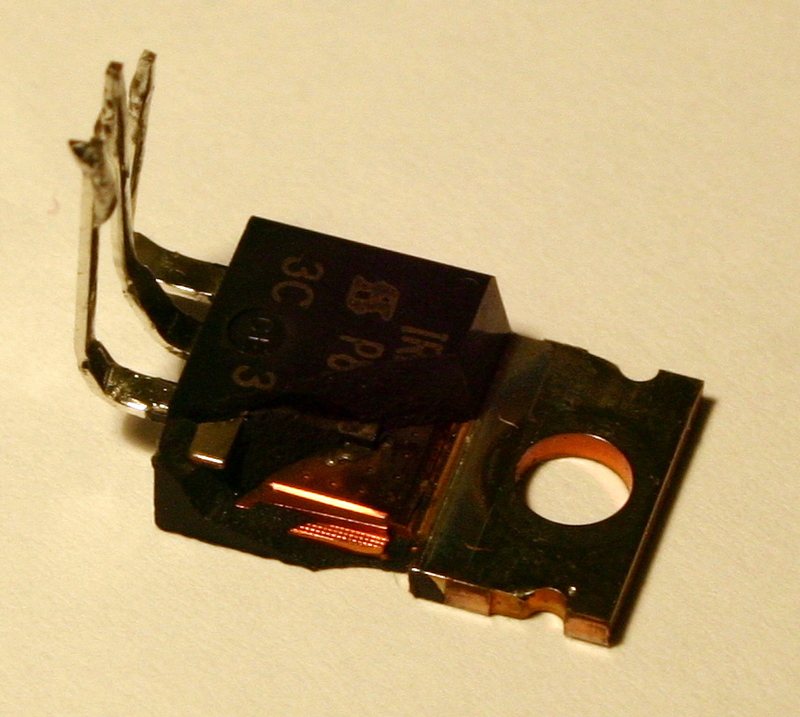 I now use in my bias tees high-current inductors salvaged from broken switching power supplies. Obviously, if the inductor has too little inductance or the capacitor too little capacitance (or a voltage rating that’s too low), that’s also not good. But there are more surprising failures to bias tees. Phil Salas described in QST in July 2004 a pair of relatively complex tees, with reverse voltage protection and with a fuse. He discovered that the 100μH inductor that he used had enough parasitic capacitance to resonate at 11.5MHz, which means that signals around that frequency will pass through the inductor and into the power supply (he modified it to remove the resonance). 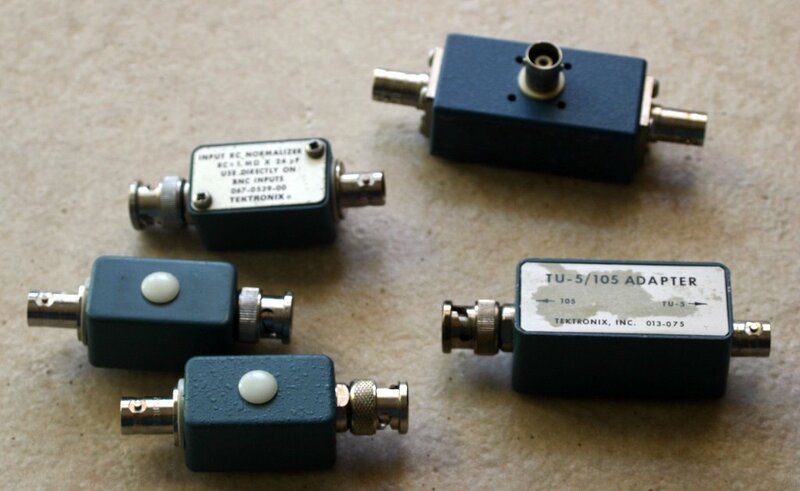 Another interesting article on bias tees is by Tom Cefalo Jr., who described in QEX in May/June 2002 bias tees optimized for 144MHz or 432MHz. I couldn’t figure out exactly what went wrong with the amplifier, so eventually I decided to try to replace the MOSFET with a more resilient one and hope it won’t explode like the first one. I know that I need to add SWR protection, and perhaps to improve the T/R switching, but I don’t have time to work on these right now. I hope that the more resilient MOSFET would be able to survive the conditions that caused the IRF510 to explode. When I took the amplifier apart, I saw that the MOSFET blew up in a spectacular way. I replaced the IRF510 with an IRF630. The IRF630 has a 200V and 9A rating, so it will be hard to destroy with a laptop 24V supply. The trade off in power MOSFETs is between improved rating (voltage, current, and on resistance) and input capacitance. The IRF510, with a 100V 5.6A rating, has 195pF input capacitance; the IRF630 has 600pF. This makes the IRF630 harder to drive. I had experience with another amplifier, an experimental class E amplifier, in which the driver chip could drive an IRF510 but not an IRF630. I was not sure that the 1W of the Softrock Ensemble would be able to drive the IRF630. I soldered the IRF630 into the circuit anyway, connected the amplifier to the Softrock and a dummy load, and tried it out. Success! The IRF630 delivered about the same amount of power that the IRF510 did.